It takes a lot more than athletic ability alone to be a collegiate athlete. Time management is as crucial as conditioning, good study habits as important as healthy ones. Meet two student athletes who graduated from our animal science program this May, who exemplify the determination, hard work and willingness to learn that we prize in our students. We’re proud to be part of their stories. The 2016 performance-tested bull sale at SIU resulted in the highest sale average at the event in the past 10 years and the second highest sale average yet. His friends refer to him as the college’s unofficial motivational speaker. And he admits that, when he’s bored, he invents inspirational quotes. Jeremy Davis, a nutrition expert at Southern Illinois University Carbondale, says a recent government mandate to phase out artificial trans fats will do little to improve the health of Americans. 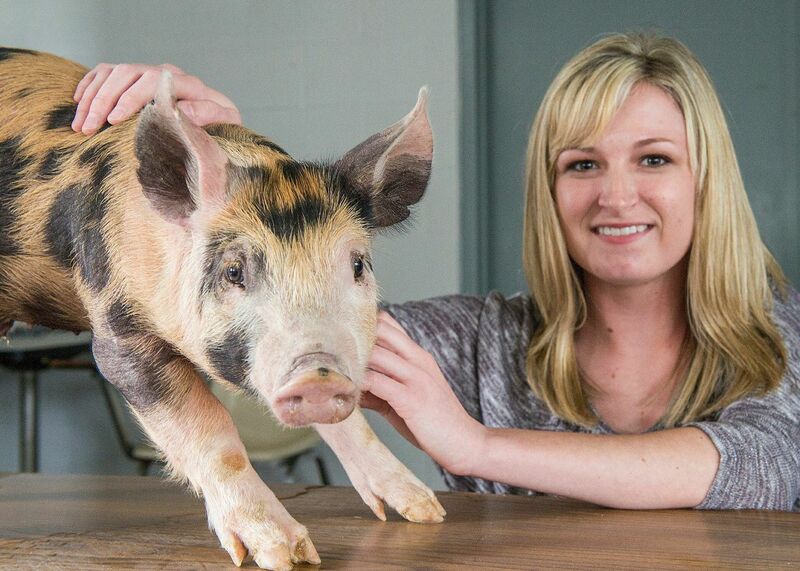 Hannah West, a senior animal science major at Southern Illinois University Carbondale, is involved in a study that ultimately may improve swine feed efficiency at the SIU Swine Farm. Erin Venable, assistant professor of equine science at Southern Illinois University Carbondale and an expert in equine nutrition, is one of a small number of researchers with access to one of the best research tools available – cannulated horses, eight of them. Southern Illinois University Carbondale will lead three 2015 Farm to School Networking Conferences in Carbondale, Springfield and Joliet in February and March. 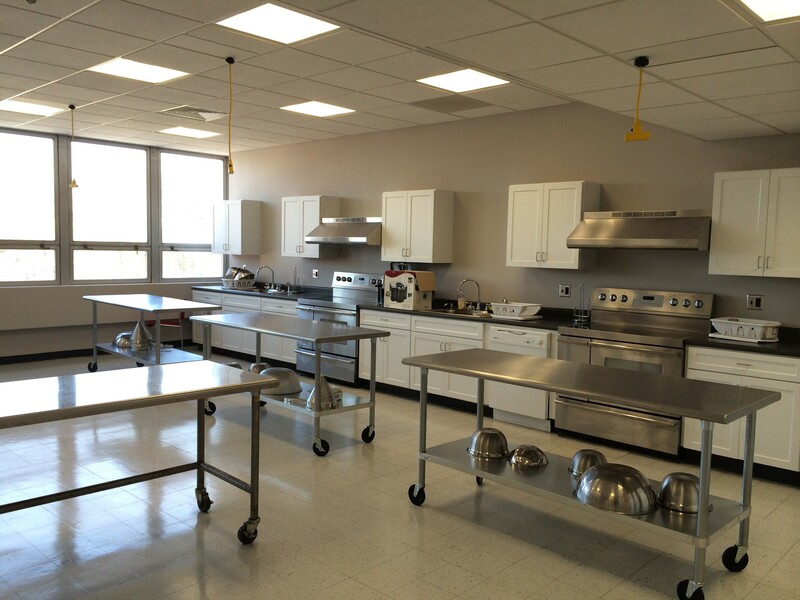 Students enjoy using the newly renovated kitchen facilities at Quigley Hall. The upgraded facilities are a hit with students! On August 16, 2013, the Department of Animal Science, Food and Nutrition welcomed Dr. William Banz as the new Department Chair! Joseph Huebener recently completed an Undergraduate Research Assistantship at the Beef Evaluation Station. Huebener cared for 52 bulls by assisting with data collection, animal care, and feeding. Amelia Stratman’s love for horses and aspirations of being a veterinarian led her to enroll in the Equine Science program. Her job at the Equine Center enables her to assist with sonograms, breeding and foal care. 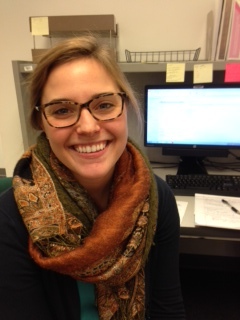 Julie Schroeter has demonstrated excellence in her undergraduate research. She will begin working on her Master's of Science degree this fall in Dr. Small's Fish Physiology Lab. A clue to the culture of a specific place is its cuisine. "Cooking Plain: Illinois Country Style," published by Southern Illinois University Press as part of its regional book selection, presents an historical, and useful, window to pre-1900 Southern Illinois. After a recommendation from business professionals on the College Advisory Board, a new graduate degree program in Hospitality and Tourism Administration was added in the Department of Animal Science, Food & Nutrition. Dr. Gary A. Apgar was recently promoted to the position of Interim Chair of the Department of Animal Science, Food and Nutrition. Dr. Apgar’s specialty is in swine nutrition, with a research program focused on nutrient content in swine diet, immunological activity of feed additives, and investigating enzyme addition in swine diets for growth and performance. A researcher with the Fisheries & Illinois Aquaculture Center is working with researchers from Chile to determine the potential for domesticating a fish breed called the San Pedro for aquaculture. Two programs in the College of Agricultural Sciences recently received re-accreditation from the Commission on Accreditation for Dietetics Education [CADE]. This Class Is For "Ewe"
At one time, the College offered courses related to sheep. However, the little lambs left campus years ago. But a growing interested in small, more manageable ruminants has the College bringing back the animals. 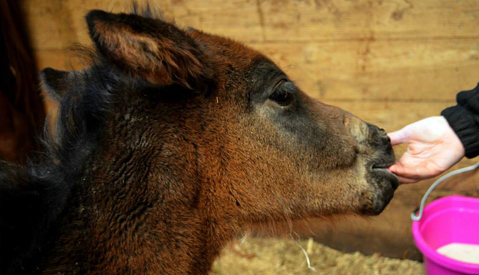 The Horse Center is home to a new foal this summer named Renee. What makes this foal unique is that her breeding differentiates her from the other foals. Do "Vegetarian Fish" Taste Better? Researchers at SIUC are collaborating on a project to determine if hybrid striped bass raised on soy-based feed taste better and are healthier and more economical than other fish. Dr. Sylvia Smith, a certified chef and Assistant Professor in Food and Nutrition is working with Dr. Jesse Trushenski, a fish nutritionist in the Zoology Department. Can cows benefit from soybean feed and forage? Dr. Rebecca Atkinson, a beef nutritionist, is completing research on the effects of soybean forage. Atkinson has been discovering that soybean plants provide pretty much the same nutritional qualities as alfalfa. Jamie M. Douglas, a graduate student in Animal Science, is working in conjunction with Dr. Karen Jones to study a potential herbal remedy for fescue toxicosis. Douglas is studying the effects that blessed thistle extract has on fungal toxin. Dr. Brian Small joined the faculty of the Department of Animal Science, Food and Nutrition on December 1. 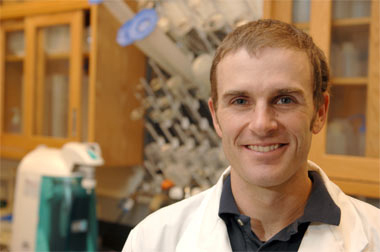 Dr. Small's research interests include fish growth, metabolism, reproduction, and the improvement of aquaculture production techniques. Is Inflammation Linked To Obesity? Animal Scientist, Dr. Gary Apgar, has been testing a blend of distillers' grains (from ethanol byproduct) and soybeans as a source for swine protein in feed. Dr. Apgar has been finding that the blend is every bit as nutritious as regular soybean meal, and less expensive as well. Dr. Karen L. Jones was the unanimous choice to serve as Interim Department Chair for the Department of Animal Science, Food and Nutrition. Dr. Jones is a specialist in animal physiology, with a research program focused on reproductive physiology in both beef cattle and equine. She also has completed extensive research in the area of fescue toxicity. Ever wonder where your food comes from? A group of students from Kendall College, a professional culinary arts school, can answer that question a little better after spending some time at the SIUC University Farms. Dr. Silvia Smith, Assistant Professor of Food and Nutrition, arranged the details of the visit. When biomass is transformed into fuel, it creates a byproduct called "glycerol." At present, there is no real value for this "glycerol." Dr. Amer AbuGhazalah, an animal scientist at SIUC, proposes that the glycerol could be an acceptable livestock feed supplement for corn. Nicole Davis, an SIUC Instructor in Hospitality and Tourism Administration, teamed up with Debbie Moore from the Carbondale Convention and Tourism Bureau to land a $100,000, two-year grant that hopes to draw culinary tourists to the region. Recognizing the need for veterinary technicians, SIUC is playing a key role in providing hands-on training and education with animals leading to an associates degree in veterinary technology. The program will be offered at SIUC to students from five community colleges through the Southern Illinois Collegiate Common Market. What is Culinary Tourism? Dr. Sylvia Smith, a newly hired Assistant Professor, defines "Culinary Tourism as ... travel for the taste and enjoyment of prepared food and beverages." Smith states that a survey released in 2007 indicates that 17% of leisure travelers include food and/or wine-related activities in their trips. There is a long-awaited change taking place within the Department of Animal Science, Food and Nutrition this fall. Crystal Doll Welsh, a master's student in animal science, took second place at the Equine Science Society's national graduate competition for research in reproductive physiology in Hunt Valley, Maryland on June 8, 2007. Dr. William J. Banz, professor in the Department of Animal Science, Food and Nutrition, led a team of multidisciplinary researchers in the research of a synthetic compound that could help fight fat and cut the chances of contracting a cluster of other conditions that is more commonly knows as the "metabolic syndrome."